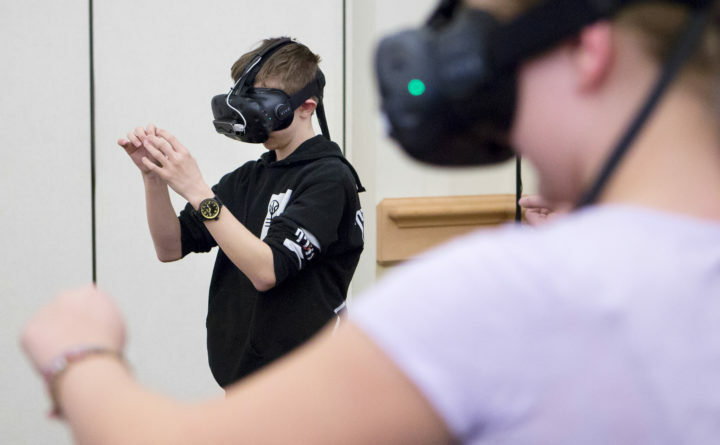 Troy Howard Middle School's Adrian Doyne-Dafmas (left), 13, and St. Paul the Apostle's Phoebe Sension, 11, test out a virtual reality simulator during the Maine Science Festival's Friday Field Trip Day at the Cross Insurance Center in Bangor, March 17, 2017. New topics to explore and new venues to visit are on the schedule for this year’s Maine Science Festival, which is set for March 13 to 17. Since 2015, the Maine Science Festival has brought experts and enthusiasts of all ages to Bangor to explore the vast array of topics within the scientific fields — from animals, plants and ecology, to cutting edge developments in genetics, physics and computer science. Dickerson said this year, the festival will expand to five days from a previous four, with a kickoff event — a science trivia night — to be held in four locations statewide on Wednesday evening. In Bangor, it’ll be held at the Sea Dog Brewing Company at 7 p.m., with other trivia nights to be held that same night at breweries and libraries in Lewiston, Kennebunk and Blue Hill. Also starting Wednesday, there is a five-day exhibit to be showcased at the Maine Discovery Museum in downtown Bangor, highlighting the science of Maine’s sea-run fish, which include Atlantic salmon, alewives, striped bass and others. Illustrator Karen Talbot has created a series of drawings exploring the life cycles and ecological importance of diadromous fishes, which spend parts of their lives in both salt and freshwater. The exhibit will be on display from 10 a.m. to 5 p.m. at the museum for the duration of the festival. “2019 happens to be the International Year of Salmon, so it’s a great year to highlight this and also look at how climate change is affecting both ocean and freshwater,” Dickerson said. New topics for panels and workshops this year include a presentation on the science of voice, with local voice teachers Tina and Phil Burns and University of Maine scientist Qian Xue, exploring just how, exactly, the human voice works, set for 3 p.m. Saturday at the Cross Insurance Center. There’s also a panel on the science of aging, with experts from UMaine, the Jackson Laboratory and the Maine AARP, set for 11 a.m. Saturday, also at the Cross Center. New venues for the festival include Queen City Cinema Club in downtown Bangor, which will host a program at 1 p.m. Sunday called “Seeing Sound,” in which Eric Ferguson of the New England School of Communications will showcase the technology audio engineers use to make sound visible. As in previous years, showcase events for the MSF include the Science on Tap event, set for 7 p.m. Thursday at Black Bear Brewery in Bangor, in which the genetic editing software CRISPR will be discussed by scientists from the University of Maine and Jackson Laboratory. At 7 p.m. Friday night at the Bangor Arts Exchange, the annual 5 Minute Genius event will give seven Maine scientists five minutes to present on their work, followed by five minutes of questions. There will also be an array of panels and workshops for all ages at the Cross Insurance Center on Saturday. On Saturday night, the MSF headliner this year is a live taping of the popular “Science VS” podcast, in which the show’s host and producer will explore the topic of science vs. UFOs. It’s set for 7:30 p.m. at the Gracie Theatre at Husson University. Though the “Science VS” event is the only ticketed event for the festival, with general admission tickets priced at $17 in advance, or $10 for students, Dickerson said this year, the MSF will begin asking attendees to donate $5 per day they attend the festival. “It is very important to us that this remain a free event that everybody can enjoy, regardless of their means, but we also need to be able to grow and stay sustainable. So we’re asking people that can afford it to donate five bucks to help us keep doing what we’re doing,” Dickerson said. For a full schedule of MSF events, visit mainesciencefestival.org.